Despite still having too few contributors to be able to report nearly as many deserving and unusual events as we would wish, Seen&Heard managed to post a score of reviews on line in April, reaching as always significant musical events, some unreported elsewhere, including a contemporary music festival in Geneva, successful opera productions at ENO (and one not so successful! ), recommendations for a few CDs & DVDs, and an extensive competition report from Greece. or other people from the choral music... we know that this is the way - - "
The sudden death of Guiseppe Sinopoli whilst conducting Aida at the end of last month shook the musical world, and his legacy is reviewed by Marc Bridle, who believes he was finest as an opera conductor. 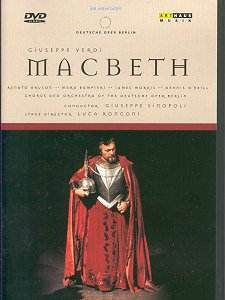 Amongst Verdi DVDs, Sinoploi's Macbeth from Berlin, just received, with Renato Bruson, Maria Zampieri and Dennis O'Neill heading a strong cast, must be recommended for most urgent acquisition - it is conducted in typically commanding and sometimes controversial style - absolutely riveting. (Arthaus DVD 100 140) Drama is all in Sinopoli's hard driven and disciplined account of Verdi's swift moving first encounter with Shakespeare, a whole world away from that of Italian traditionalists like the great veteran Nello Santi, whose memorably flexible moulding of the music and consideration for his singers was admired in the equally dark Simon Boccanegra seen&heard at Zurich. The spare staging for Macbeth by Ronconi, with evocative lighting, and camera work focusing on the haunted protagonists, makes it impossible to take ones eyes off Mara Zampieri's chilling Lady Macbeth, her steady, deliberately unlovely voice cutting like a laser (Verdi sought brevity from the librettists and banished bel canto in his unfashionable quest for authentic, psychologically true expression). In the last act sleepwalking scene she finds too the 'husky, stifled voice' Verdi wanted, and Sinopoli discovers a tragic grandeur there and in the swift denouement. This is a Macbeth for the new century and a worthy memorial for Guiseppe Sinopoli. We have continued to experience conflicting reactions whilst watching opera DVDs, several of them Verdi, received since our first round-up: About DVDs - reflections from the Editor of Seen&Heard. They vary disconcertingly as to musical and visual values and directorial approaches, and our firm preference remains with those that take us into the theatre to share the experience of a live audience. The Decca Traviata with Angela Gheorghiu & Solti (Decca 071 431-9) captivated us with its truthfulness in capturing the essence of a historic live event, more than did the sophisticated Arthaus film version of Peter Hall's Glyndebourne's production, with Haitink stolid in contrast with Solti, and for home viewing the cameras over-busy in chasing complex detail in close up, with unrealistic sound quality and balance and multiple images counter-productive in ensembles. (Arthaus 100 112) But we had a long and cautionary voyage of discovery, which we passed on to S&H 's readers of our review of the Gheorghiu/Solti version by way of warning, before learning that we have to replace our two TV sets with a third in order to read Universal DVDs (Decca, Phillips & DG) in colour! We have had faith in Il Trovatore as an opera restored by the straightforward, starry Met version with Marton, Zajick, Milnes & Pavarotti, (DG 073 002-9) which gave us a first opportunity to see one of those productions conducted by James Levine which we had heard so regularly broadcast from New York on Radio 3. We are currently revelling in the Met's entrancing Arabella (DG 073 005-9) in which casting, conducting and filming of the domestic interchanges unite in perfection, the soaring voices of Marie McLaughlin & Kiri di Kanawa blending as one with Christian Thielemann's phrasing of the sumptuous score. Wolfgang Brendel characterises ideally the arrogant, wealthy suitor who, after Hofmannsthal's contrived misunderstandings are resolved, receives the economy 'glass of water' (no silver rose this time) which ensures Arabella's future bliss and the family's solvency. The reactions of each character whilst another is singing are never overdone and are superbly caught, and the whole is vastly enhanced by the subtitles, lack of which had left me underwhelmed by Arabella in the past. They are absolutely indispensable for relishing the detail of the wordy and pointed libretto. At the end of the month Seen&Heard and MusicWeb take holidays, and we will be in Lisbon for the 25ºs Encontros Gulbenkian de Música Contemporânea, a mouth-watering feast of important music rarely to be heard in UK, which will be reported by S&H in June.